A TEENAGER who ‘embraced life’ before cancer took it away was honoured at an annual toy run. Clad in black leather garms and armed with gifts, motorbikers with ‘the biggest hearts’ put smiles on poorly children’s faces yesterday. More than 150 riders from the Oxford Harley Chapter roared into the car park at Oxford Children’s Hospital, for an annual event named after Blackbird Leys schoolboy Jake Spicer. The teenager is remembered every year at the Jake Spicer Toy Run, which was renamed in his memory after he lost his life to bone cancer in 2009. It sees bikers ride in convoy from the Harley-Davidson dealership in Abingdon to drop off toys for young patients. Jake’s mum Lesley Spicer said the event has become a ‘family tradition’ that helps to keep her son’s memory alive. The 52-year-old said: “I only get to meet them [the bikers] once a year but they are truly amazing. They remember me and my son. It’s been emotional from day one [when Jake died] up until today. Jake was a motorbike fanatic who loved to join the bikers on their visits while he was a patient. He forged friendships with members and earned the nickname Little Harley, while his friends knew him as OX4 Soldier in recognition of his hard-fought cancer battle. Mrs Spicer said: “Jake was not just a person with cancer; he was a young boy with a big heart. He embraced life and he put everybody else first. The supermarket worker was joined yesterday by Jake’s dad Michael Spicer as well as his 24-year-old brother Ryan and 12-year-old sister Maddison, who Mrs Spicer said ‘idolised’ her late brother. This year the chapter, directed by Ian Davis, brought along specially-made pins bearing Jake’s name to sell in aid of the children’s hospital, raising £600. He said they had more riders than he could ever remember, including from several other chapters. MORE than 100 bikers roared up to Oxford Children’s Hospital for their annual toy drop. The Harley-Davidson riders from across Oxfordshire and beyond dropped off two crates full of puzzles and games yesterday for some of the least fortunate children in the city. Hospital staff said the annual visit, running since 1999, sent a buzz around the hospital in Headington. Several children and their families met the bikers outside when they arrived, including three-year-old Poppy Bullock. Poppy was diagnosed with a Wilm’s tumour, a type of kidney cancer, last year when she was just two. Yesterday with her brother Jacob, four, and parents Susan and Paul, she joined the excitement and even got to sit on a real Harley-Davidson. Mrs Bullock, 37, who lives near High Wycombe, Buckinghamshire, said: “It’s incredible – we didn’t think there would be this many. Many children at the hospital were too sick to leave their wards, but staff said they could still join in the excitement by watching from the windows. Senior play specialist Sally Hitching said: “I’ve been meeting these guys for 20 years and they are always amazing. “They bring lovely gifts, which keeps us in presents throughout the year. What isn’t given out is used for birthday presents or rewards for when children have a bad day. “They love it, they love all the excitement. There are up to 100 children at the hospital with illnesses ranging from broken bones to tumours like Poppy’s. All the bikers came from the Oxford, Thames Valley and Rolling Hills Cheltenham Harley-Davidson chapters. Each chapter is based at a dealership – the Oxford dealership is in Wootton, near Abingdon. Oxford member Ron Coles, a former ambulance driver, was one of the founders of the children’s hospital present drop 16 years ago. The 73-year-old from Newbury, who arrived on his Road King, said: “For some of the bikers who have never been here before it is a real eyeopener. The annual tradition was named the Jake Spicer Memorial Run in 2010 after a former hospital patient who lost a six-year battle with cancer the year before. Yesterday his mother Lesley Spicer joined the rally at the hospital and said: “It’s amazing as always. She said Jake, who would have been 21 in May this year, “would have loved it”. Last updated 13:03 Thursday 16 April 2015 by Alex Regan. Reporter covering Headington and Marston. 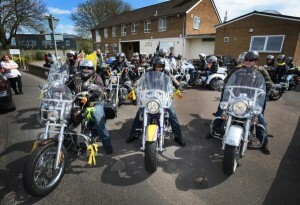 THREE pensioners had the ride of their lives when 25 Harley-Davidson motorcyclists roared up at their care home.The men – from Townsend House in Headington, Oxford – rode the iconic motorcycles on Sunday when the Oxford chapter of the Harley-Davidson club paid them a visit. For former gardening volunteer Russell Blackmore, a 73-year-old with learning difficulties, it fulfilled a long-held ambition from his bucket list. Mr Blackmore, who was originally from Bicester, said he had always wanted to ride a Harley-Davidson but had never had the opportunity. Upon hearing this, care home manager Maggie Coleman contacted the city’s Harley dealership.Oxford club chapter president Malcolm Taylor was happy to oblige, and 25 bikers visited the home to offer rides to Mr Blackmore and the other residents. The 53-year-old Abingdon resident said: “We were first contacted by the home who asked if we could take an old resident for a spin.“He was planning to come over to the shop but was too ill to travel. “So we decided to bring the bikes to him instead.”Mr Blackmore said: “I did like it. I was a young lad and wanted to do it before.“I enjoyed just sitting on it.” Fellow resident Robert Cambrey-Denton also got a chance to relive his youth by taking a spin on a trike. The 88-year-old said: “It was wonderful.“I can’t describe it. “It took me back to when I was a kid. “I remember my father bought a ‘noisy Norton’ as they called it. Daniel Lyons, 79, also got on the back of one of the bikes .He said: “It was really lovely. “The noise the bikes make is the exciting bit.”On the same day as going to Townsend House, more than 100 Harley riders also went to the Oxford Children’s Hospital in Headington to give toys to ill kids. Mr Taylor added: “When people think about Harley-Davidson they immediately think we’re part of the Hell’s Angels, far from it. “We often do a lot for charity and want to do things to help the community. Mrs Coleman added: “All of the residents seem to really love the day.